One of my most liked Taiwanese Actress is Ariel Lin. I’ve seen her in Love Contract with Mike He, Tokyo Juliet with Wu Chun, It Started with a Kiss and They Kissed Again with Joe Cheng. She also had Love or Bread still with Joe Cheng but I didn’t watched it. She was out of the dramaland for a year or two due to her physical health. 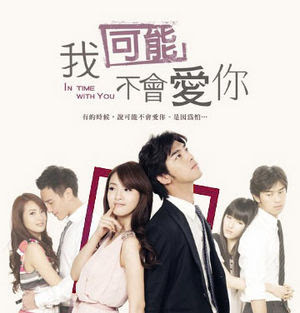 Her latest TwDrama: In Time With You, might also be her last. I will surely miss her if that would be the case. On her 30th birthday, Cheng You Qing received an email on "the symptoms of premature aging" from Li Da Ren, her best friend of 14 years. Unable to accept that Li Da Ren is like a fine wine that will get better with age and she is like a grape that will dry into a raisin as years go by, she made a bet with Li to see who will get married first before they turn 35. As she looked around for a potential husband, she discovered that she was surrounded by unacceptable candidates, like gay assistant or cheating ex-boyfriend. The only man who could love her despite her ill temper and stubbornness is her best friend. The only problem was that they both swore that they were not or will ever be romantically attracted to each other.